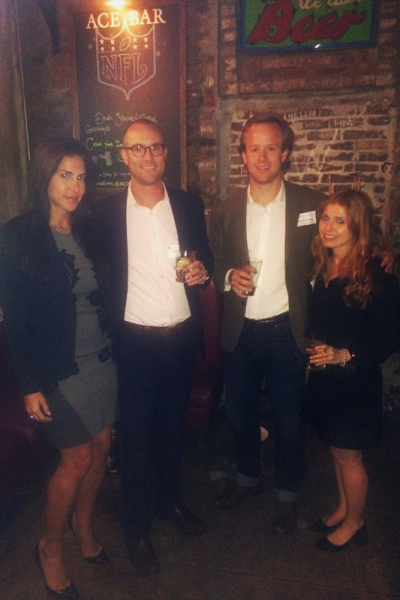 Thank you to everyone who came out to Ace Bar on Thursday, September 29, 2016 for YPEM’s Fall Fundraising Event! Our dedicated crowd of supporters couldn't be stopped by the rain, and were welcomed to the beautiful and eclectic East Village on Thursday night to enjoy this casual night of networking for a cure. As YPEM's third event in New York, Guests had a fantastic opportunity to re-connect with familiar faces and network with new connections over Ace Bar's extensive collection of games including darts, skee ball, and pool. Attendees enjoyed free happy hour drinks and a plethora of delectable dishes provided by our generous Event Partners. The delicious food included gourmet pizzas donated by Baker's Pizza, a variety of healthy burritos and tasty protein muffins provided by Eva's Kitchen, cancer-fighting pasta dishes thoughtfully prepared by Gnocco, and mouthwatering wings from 5 Napkin Burger. Everyone who attended the event was entered to win two tickets to the 3rd Annual Expect Miracles in Manhattan Event on Thursday, January 26, 2017 at The Edison Ballroom. Congratulations to Pat M. from Goldman Sachs for winning the tickets to the event! If you are interested in attending or volunteering at Expect Miracles in Manhattan Event, please contact Megan Melville at mmelville@expectmiraclesfoundation.org. In addition to supporting the fight against cancer, this is a great networking opportunity for volunteers who will be assisting with registration, auctions, and more. As with every YPEM event, the money raised from this night will support cancer research at Memorial Sloan Kettering‎ as well as our Expect Miracles Foundation College Scholarship, awarded annually to a young adult impacted by cancer. YPEM is looking forward to more great events in New York and Boston this year to share the mission of Expect Miracles Foundation within the young professional network. Check us out on LinkedIn, follow our facebook page, and sign up for our mailing list to keep up to date on upcoming YPEM events. If you would like to get involved with Expect Miracles Foundation’s events, volunteer opportunities, or are interested in becoming a YPEM Ambassador please email Megan Melville at mmelville@expectmiraclesfoundation.org.